February 29, 2016 - No Comments! John Oliver has a way of skewering the bombastic and spreading a meme like no one else can. Marketers would be wise to watch his savvy tactics, because he consistently nails the format. The latest target worthy of Oliver's ire is none other than Donald Trump aka Donald "Drumpf" (Watch the video to see why). Then install the Chrome Drumpfinator plugin and get in on the antics. And if you like hats, why not pick up one of these for yourself. It's a worthy bandwagon to be sure. Enjoy, and help Make Donald Drumpf Again! February 26, 2016 - No Comments! When Will Agencies Get Mobile? Quite honestly, I'm not one to quote Martin Sorrell but he really nailed it in his comments about the state of mobile and current traditional agencies. "We haven't adapted," said Mr. Sorrell. "When people talk about creativity in our industry, they're talking about Don Draper. They're not talking about the new definitions. Believe it or not, people inside media agencies are creative. Software engineers are creative ... It's the definition of it -- we haven't contextualized it correctly yet." I wonder if traditional agencies will ever get mobile... or the mobile revolution, or the people who use mobile (aka everyone). Consider that 60% of all YouTube videos are viewed on mobile. And the people watching those videos are young, don't have TVs, and live digital lifestyles. Any company that thinks trying to reach them with approaches developed 25 years ago or interrupting them with a "message" on the hope that it will spur an action is lost. The world changed. It's time for "agencies" to change, too. READ: Martin Sorrell on Mobile: 'We Haven't Adapted' | Digital - AdAge. When someone from the Trump campaign spells Oklahoma wrong on event page for Friday's speech you just know someone's gonna get fired. READ: Trump campaign spells Oklahoma wrong on event page for Friday's speech | Oklahoma City - OKC - KOCO.com. I, for one, welcome our new bipedal, autonomous, robotic, and soon-to-be-weaponized overlords. I think Facebook did a really nice job improving the "Like" function with enhanced emoticons. It's about time and worth the wait. Now, who will be the first brand to jump on it? When will the first branded emoticon appear in the lineup? And, here's the whole story behind this development. I LOVE what Under Armour is doing these days. The work is crisp and insightful. What Nike used to be before they became a tired cliche. I especially like how the spot ends, "It's what you do in the dark that puts you in the light." As someone who has spent many many hours getting up at 445am to head to the gym, or the pool, or hit the road on my bike... I get it. I still quietly tell myself to, "just do it." But when I do, it's in the dark. And, it's not just me... this campaign speaks to my 9-yr-old daughter who can't stop doing handstands, and cartwheels, and pushups with a vow to walk on her hands by the end of the summer. Under Armour just captured the attention of a young generation. And where did she see this ad? Not on TV. She saw it while watching clips on YouTube. As they do. February 23, 2016 - No Comments! Brilliant marketing. A Portland girl scout sells cookies outside of local pot shop. "That's one way to raise money for horse camp - the Girl Scout said she exceeded her cookie box goal for the day." RxRun is a film about the life-changing work being done by Dan McGann... to help teens manage their depression and anxiety through running. WATCH: The RxRun teaser from Mplify Media Inc on Vimeo. "Think of it as a citronella candle on wheels. Mosquito-bourne illnesses are a growing issue in Thailand's slums, with the incidence of dengue fever tripling in 2015. To battle the glut of diseased pests, a Thai charity, the Duang Prateep Foundation, and its agency BBDO Bangkok, repurposed another abundant local feature -- motorcycle exhaust fumes. 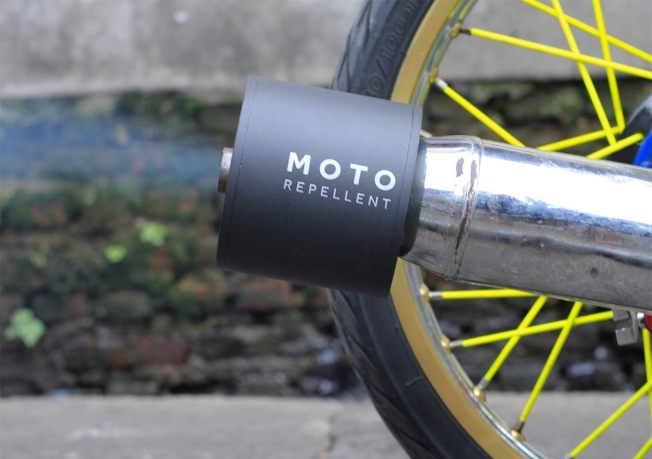 The result is Moto Repellent, an anti-bug filter that riders--ubiquitous in Thailand--can attach to their tailpipes. The filter contains mosquito repellent oil that, when mixed with the heat from the engine's spent fuel, produces a special smoke that can deter mosquitos for up to three meters." READ: MotoRepellent : Saving Lives One Ride At A Time from #BBDO Bangkok. This is the soundtrack of my day.